Grrrrrls: A dog is man's best friend. They can also serve a purpose during an intense basketball game. 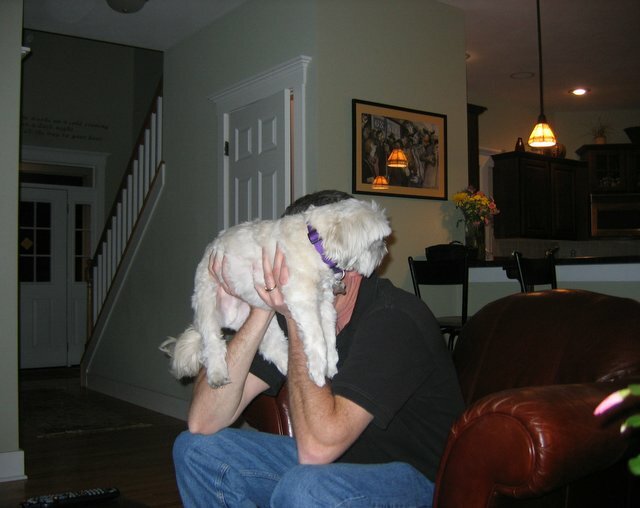 3. when the crowd cheers or groans, put dog back down. It was an exciting four days of basketball watching in our house as S.U. won the Big East Championship. Three cheers for your team! I bet you had a blast watching them win. Your doggy is so ooochee cooochee cute! Is that a Cockapoo or a Shih Tzu? Looks like I am gonna have to get my driver's hat oout again and fire up the band wagon! I put Bailey into my backpack and left with him. You're never getting him back. bailey: *looks toward pantry* Meaty bones?